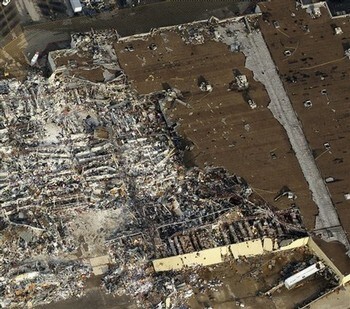 Below: Arial photo of what’s left of the Walmart I was in just before the tornado hit in Joplin, Missouri. Walmart on 20th St. and highway 71 in Joplin (the one I ran into). Photo courtesy AP. Over the past week, it seems like all I see and hear in the media and even on Facebook is more tragic news about the Joplin, Missouri tornado. I can’t get the event out of my mind, so I thought I’d recap some parts of the chase day here on my blog. The single most horrible thing that occurred that day was when I ran through the Walmart at 20th st. and highway 71 in Joplin. MaryLeigh and I were in a frenzy trying to locate a topographic map of Missouri, in an attempt to both 1)escape the deadly wedge tornado, and 2)maybe have a chance at getting into a position to view it before diving south. Anyways, when I parked the car in the Walmart parking lot, all we could see to our northwest was a black sky with a lowered base disappearing into the rain (apparently, THAT was the tornado). At the time, we actually didn’t know for sure that there was a tornado. But I had a very, very strong suspicion that there was a wedge approaching. In fact, I was nearly 100% sure, and quite frankly, a bit scared. NOTHING is worse than storm chasing through a city when a major, rain wrapped tornado is on the ground. Any storm chaser would agree that is a very, very dangerous situation. Period. I told MaryLeigh I would run into the store just for a minute (literally) and grab a map if they had one. I ran as fast as I could, passing by families that were leisurely walking into Walmart to shop. The tornado sirens were blaring, so I’m not really sure why anyone would be so lackadaisical about the current severe weather situation! I didn’t see any maps at the front of the store, but there were three employees talking in a frenzy right by me. So I asked, and only after asking repeatedly several times did the employee finally mumble an answer…saying they were located in the back of the store. The employee was clearly aware of the tornado warning/siren, and was quite literally about to freak out, trying to hold her own composure. I felt really, really bad at that moment, because I realized if a tornado did strike there was nothing I could do to save anyone. I had to focus on mine and MaryLeigh’s lives. Every second mattered, and I figured you would have to be underground to survive whatever was coming (given the conditions). I RAN to the back of the store, didn’t see anything resembling a map section, then RAN as fast as I could to the front of the store and out. I passed by several families calming shopping, as if nothing was going on. For the life of me I wish I could have told all of them to get underground or something, but there was simply no time for any of that. I knew every second counted. I had to get back to the car, to MaryLeigh, and get south immediately. I’ve never had such a sense of urgency ever in my life than I did in this moment. 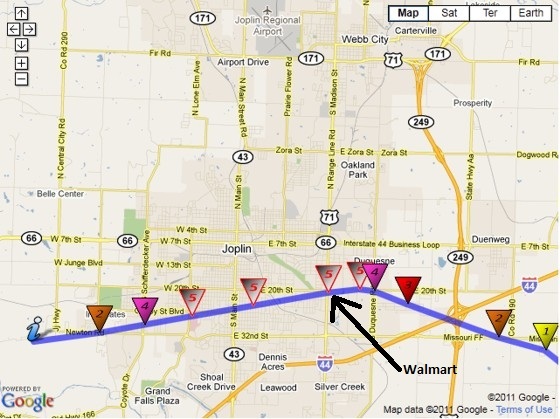 Damage path of the Joplin, Missour EF5 tornado. The arrow points to the location of the Walmart where I went inside. We left the parking lot, hauled it south, and continued on our journey out of there. But emotions began to run high as the day wore on when we found out that Joplin had been completely destroyed, and the Walmart I had run through was leveled. It’s quite likely most of the people I saw in that store are now deceased. The employee I spoke to briefly may no longer be alive. 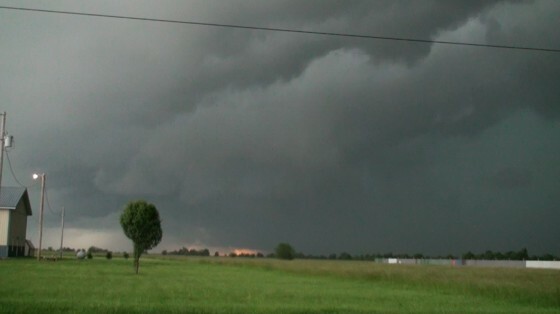 Just moments after we left, that EF5 tornado destroyed everything. It’s quite a traumatizing thing to experience, and I truly hope I never experience anything like this again. 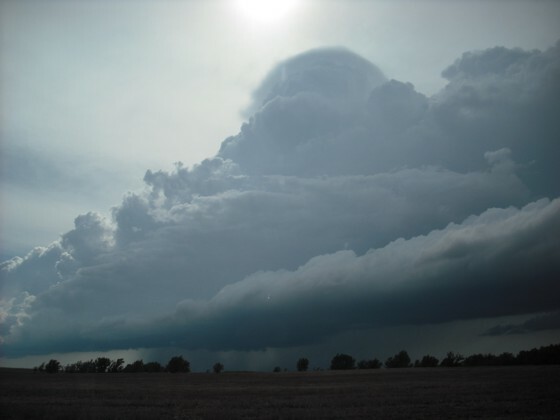 As a meteorologist and a storm chaser, I have a strong passion for experiencing severe storms and tornadoes. But this was neither — it was an experience in human behavior right before a major tornado. 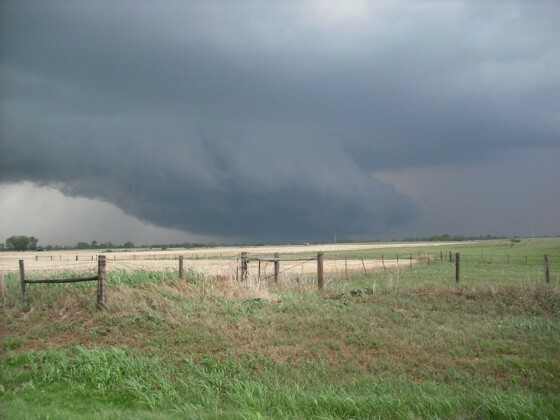 This began as a typical storm chase, but ended as an escape from a deadly tornado, involving experiencing the seconds before human suffering. My thoughts go out to the people of Joplin, Missouri. Our chase trip on the plains ends with debris raining from the sky in Norman, Oklahoma. Our chase trip has come to an end after two weeks on the plains. I had hoped that our last day (Tuesday) would have been more successful. But instead it turned out to be a very tough chase day. 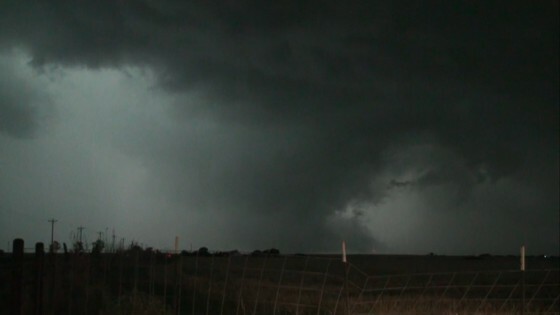 It should be a reminder to all chasers that even high risk days don’t always end with a big tornado. 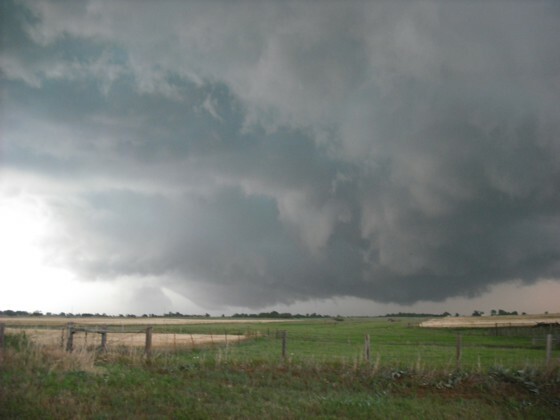 Even high risk days can bust to some degree, leaving many chasers scrambling for tornadoes. I had targeted north central Oklahoma, and headed to Blackwell initially to look at data and then head west. But storms fired earlier than I expected over western Oklahoma, and much further south than I had hoped. I figured more cells would fire further north. But they didn’t, so we ended up gunning it south and west towards the original cells. Just as we came somewhat close to the first cell southwest of Enid that had confirmed tornadoes on the ground for several minutes, it began to weaken as the cells further south were messing with it. But this was only the beginning of a game of ‘dive south to the next cell’ for the rest of the day. We caught the next cell on the far northwestern side of Oklahoma city, north of Edmond. The mesocyclone was completely rain wrapped and we couldn’t see anything. This was really disappointing because the rotation on radar was very, very strong, usually indicative of a violent tornado. We then dove south and I figured we could maybe catch back up to that cell if we hit the turnpike heading northeast just a couple miles to the south. However, the cell to the south quickly took off big time and was showing a massive hook echo, headed straight for Moore, OK! Rain wrapped meso on the cell in northern Norman/Moore, OK. So, we hauled it south through OKC and zoomed through golf ball sized hail on the north side of Moore. We got off I-35 on the extreme north side of Norman at the Indian Hill road exit and watched yet another rain wrapped meso! Dozens of chasers pulled up behind us and watched rain curtains wrap around a violent looking meso, but no visible tornado. We could barely make out a wall cloud before rain obscured everything. 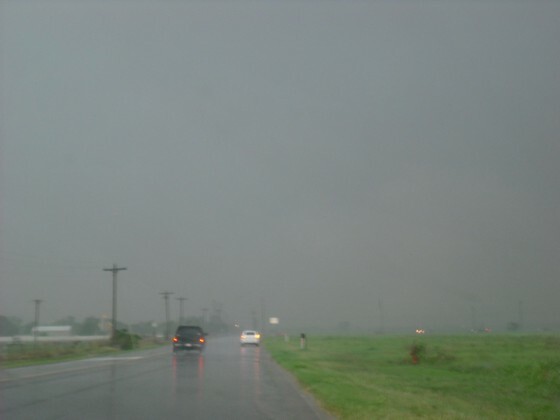 Then the rear flank downdraft winds pounded us, shaking the car violently, so we dove south on 35 to highway 9 in Norman towards the next cell. 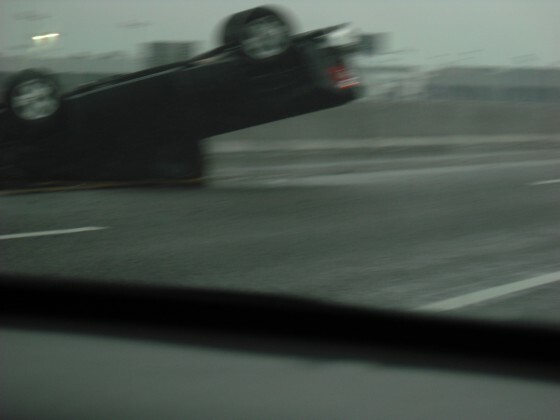 Car flipped on interstate 35 on the north side of Norman. 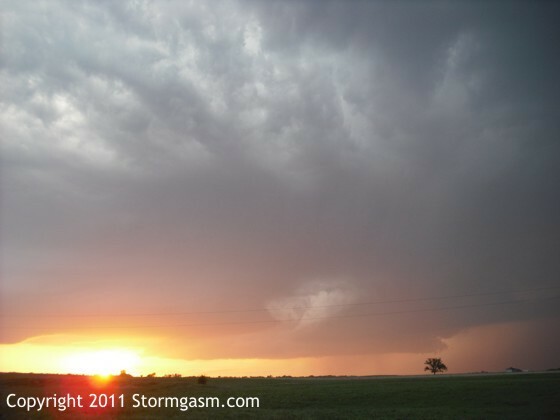 We drove east through Norman on highway 9 towards the updraft of the next supercell. This time, debris was literally raining from the sky! Pieces of tree branches, dirt, pieces of homes, insulation, you name it, pieces of things were actually falling out of the sky on the south side of Norman. It was an amazing thing to experience. 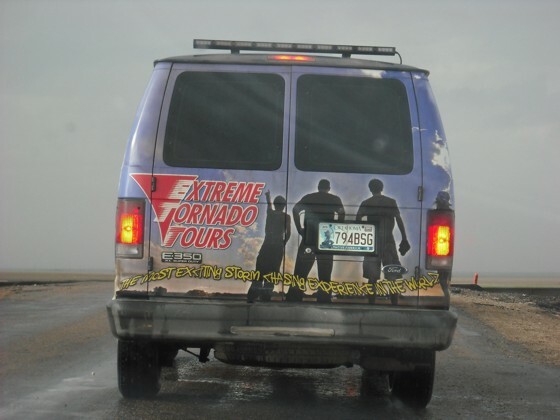 I’ve only seen this on a few other occasions, and all of them involved violent, long track tornadoes. Maybe this is finally the one exception. While that was quite intense with the tornado sirens blaring as we (ironically) passed by the National Weather Center, the storm itself was actually weakening and the chase was over. It was a bit disappointing to end the chase without seeing a tornado. But the forecasts did not pan out like myself or any other chasers expected. Sometimes that’s just how it goes. It looks like things are going to pick up on the plains again this weekend into early next week with more tornadoes. Good luck to all who are out there. 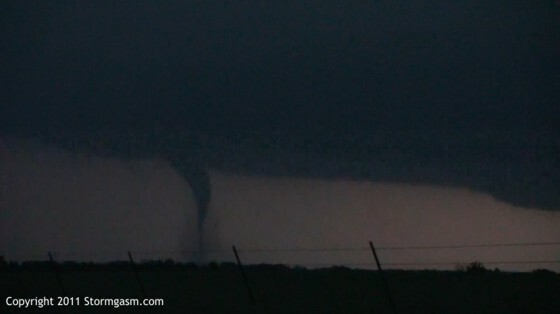 MaryLeigh and I witnessed a small rope tornado near Okeene, OK on Monday. We drove to Enid and looked at data for about an hour. Before too long storms begin firing to our west, and we headed west out of Enid. The initial storm that got us to leave started looking cruddy as another storm to it’s south began taking over. Therefore, I made the decision to dive south. We made it to Okeene, Ok just before the tornado touched down. Afterwards, we drove north towards a developing hook echo on radar on the original storm west of Enid (it was back-building). Unfortunately, by the time we were getting into semi decent position, the storm turned into a rain producing beast and seemed done for the day. But we could see a massive tower shooting up to our south. I looked at the radar on my cell phone and saw 40,000 foot echo tops showing up well to our south. So, we shot south to Watonga. Supercell exploding to our south. After quite a long bit of driving south and navigating, we found ourselves south of the updraft of an amazing looking supercell! 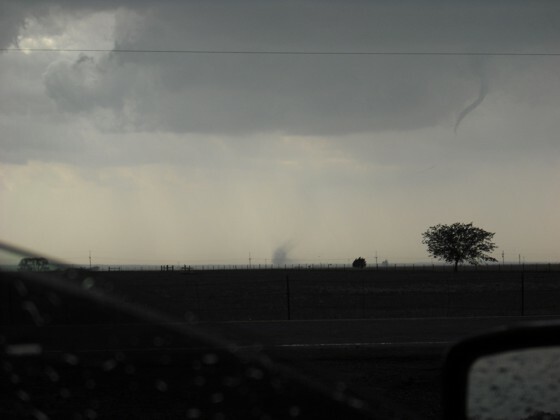 It seemed to be struggling with the CAP (a warm layer of air in the mid-levels of the atmosphere that can put a lid on updrafts) however, and showed no signs of producing a tornado any time soon. We navigated through some gravel roads (in a Honda Accord, haha!) 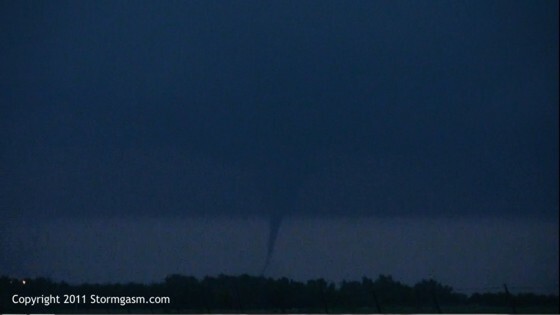 for many miles and ran into literally dozens upon dozens of chasers and tours groups. Finally, the storm died and we gunned it north towards the original cell that was still back building now west of Kingfisher. It was showing hook echoes on radar and had some rotation. 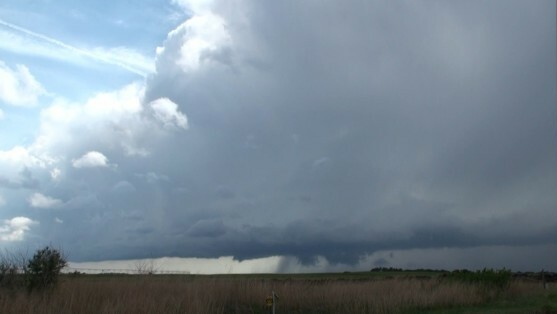 This cell ended up producing a couple decent wall clouds and funnels, but no visible tornadoes. 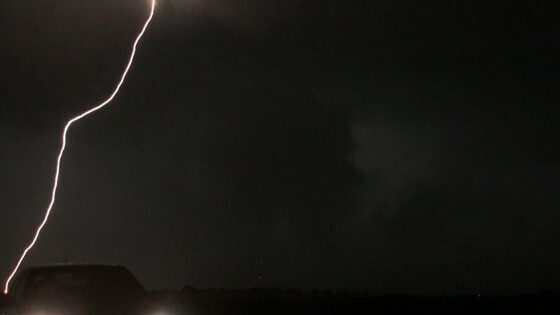 It produced some amazing lightning and was quite a spectacle. All in all, this was a very successful chase day. Looking west from somewhere well south of Joplin at a tornado producing supercell (rain wrapped). 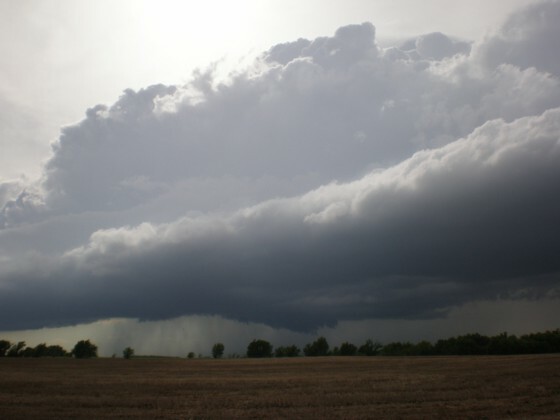 MaryLeigh and I had an extremely stressful, somewhat frightening, and very extreme storm chase across southeast Kansas into southwestern Missouri/NW Arkansas on Sunday, May 22. The highlights include: 1)the car being struck directly by lightning while we were driving, 2)plowing through baseball to scattered softball sized hail and nearly losing our windshield, and 3)getting away from a deadly, 1/2 mile wide rain-wrapped wedge tornado that destroyed Joplin and killed dozens. I targeted southeast Kansas, and we made it to Independence in the mid afternoon, putting us in decent position to intercept the initial storm to our north. We made it to Parsons, KS and the storm had really exploded. We saw a few weak wall clouds to the west of town, but the storm was still getting its act together. As time went on, the cell seemed to be back building, and the rotation was in an area with no roads. Meanwhile, another area of rotation was showing up on the same cell further east. 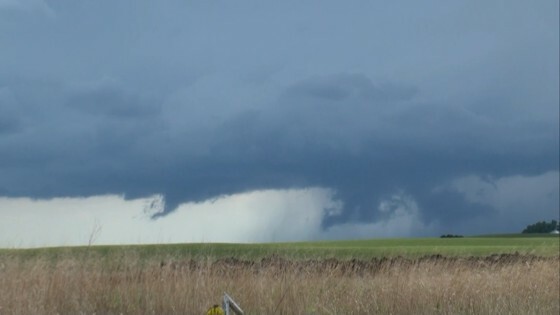 This lead to me and many other chasers driving back and forth on highway 160, trying to decide which meso would produce. Finally, I decided to just continue east and figured eventually the eastern meso would take over. 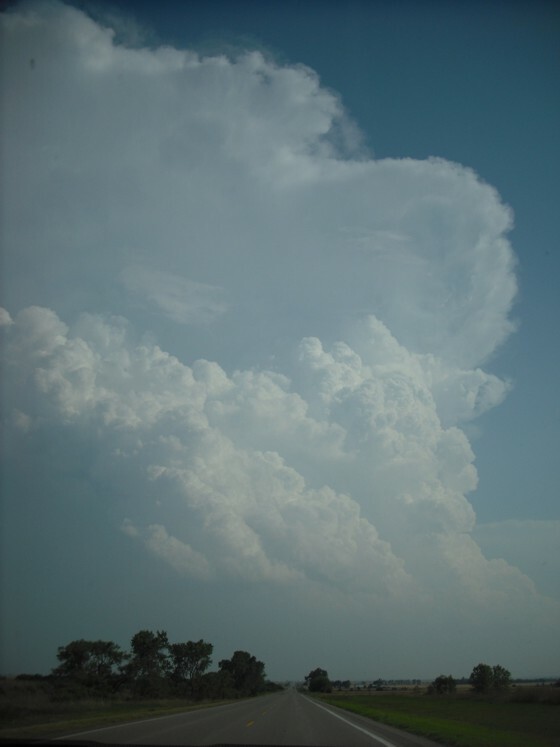 Unfortunately, another cell exploded right over us a bit west of Columbus, KS. Amazingly, this thing started dropping baseball sized hail very quickly! So all the sudden we (and Silver Lining Tours, who were behind us, great tour company by the way if you’re interested) were trying to punch through a massive hail core that seemed to come out of nowhere. Luckily, the big ones missed our windshield, but a couple huge stones nailed our roof! Then, just when we thought we were safe, lightning struck the car!!! For me it felt like a very heavy, large brick slammed the roof. I felt a very strong tingling sensation and was left very disoriented for several minutes. MaryLeigh felt impact that seemed as if it were coming from below near the front right tire. MaryLeigh’s cell phone crashed, and the electronics in the car went blank for a couple seconds. But it seemed that no permanent damage occurred (or at least none that we have found yet). Soon we reached the Missouri border, and we didn’t have a topographic map of Missouri. Before leaving for the chase I honestly didn’t think we’d reach Missouri so soon. Plus, we were in a very hairy situation, which made this ten times worse. 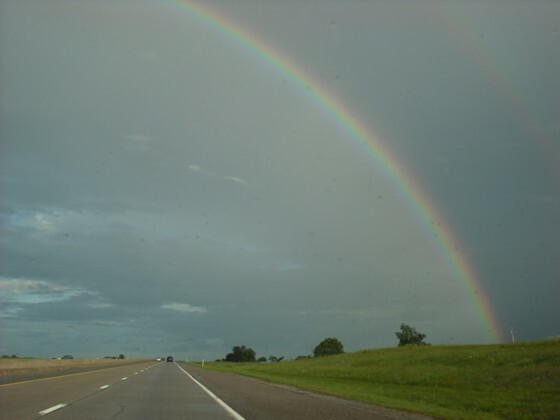 The road was riding the edge of the hail core, and the state highway curved northeast 2 miles before reaching highway 71 in Missouri to go southeast. So, we had to drive through some residential neighborhood, plowing through streets faster than I’d like to, trying to 1)stay the hell away from softball sized hail, and 2)keep ahead of what looked like possibly a massive wedge tornado developing back in the rain just to our northwest. BTW, looking to the northwest, all you could really see was the edge of a dark, black wall cloud and the end of the world (black as night). It was all very ominous and frightening, since all I had for a map was the general state map without all the county roads and details. So, we stopped at every gas station we passed and I frantically asked/searched for a topographic map..of course nobody had one. The tornado sirens were blaring and people were acting like it was just another day at the beach! 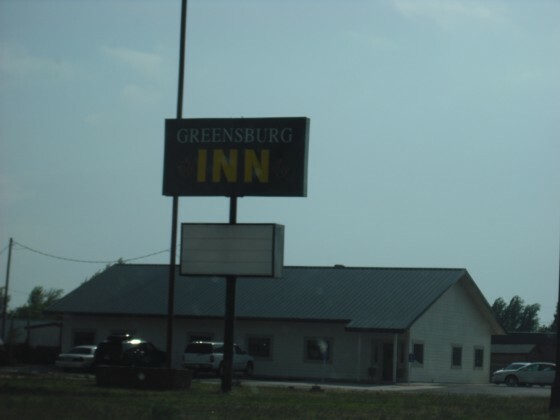 We continued through the city of Joplin, driving through the streets, looking for 59 south. Meanwhile, the dark mass of hell to our northwest (apparently a 1/2 mile wide wedge tornado by this point) was gaining on us FAST. And, so was softball sized hail. I’m pretty sure that you would have to been sitting in heavy rain and massive hail to actually see that tornado, because that thing was completely wrapped in rain from my perspective. Time was of the essence, and I’d never ran through a store so fast in my life! I asked three different employees where the maps were, and only one answered after I asked three times. They were freaking out because of 1)the tornado sirens were blaring, 2)the dark mass of hell approaching outside, and 3)the news coming out of Joplin. I ran to the back of the store, didn’t see any maps, and then ran out and back to the car, completely out of breath. The dark mass of hell was getting really close. I got in the car and continued south. 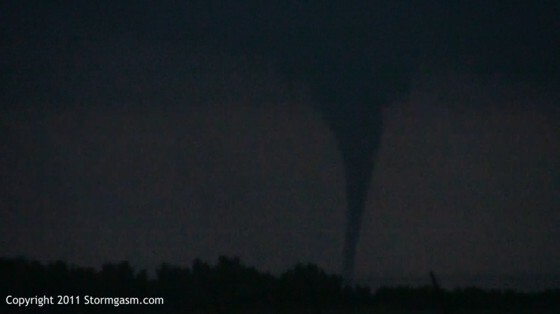 We continued diving south and ended up in northwestern Arkansas and saw some more storms without visible tornadoes. But it was getting dark and the new ‘goal’ was truly to just get back to Derby safely. We had to take many small roads to basically drive around numerous big hail/lightning storms that kept developing in northeastern Oklahoma on the way back. We didn’t arrive back in Derby, KS until 1:00 a.m. The chase had lasted about 13 hours, and that involved non-stop driving, stress, adrenaline, and a bit of fear. What a day. My thoughts go out to the people of Joplin, Missouri. We are completely exhausted. Looks like tomorrow we’ll be headed to somewhere in northwestern Oklahoma. Looking north a few miles south of Emporia, KS. 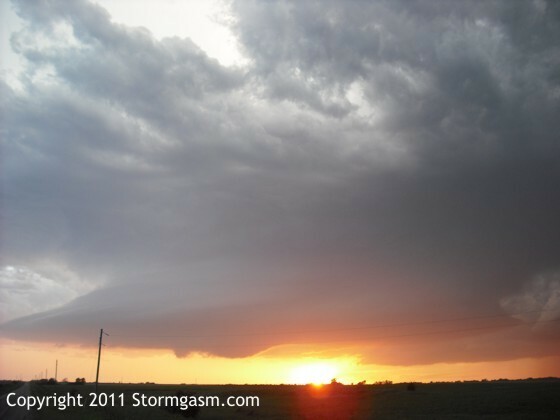 MaryLeigh and I documented a very photogenic supercell and a night time tornado in the vicinity of Emporia, KS on the evening of May 21, 2011. I have posted some photos and video captures below. Finally, some success!!!! Supercell trying to organize south of Emporia. Supercell becoming much better organized. 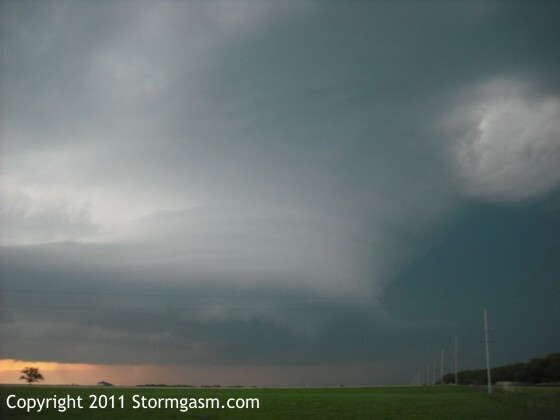 Amazing supercell about 5 minutes before producing the tornado. After over a week of marginal chase days, it looks like things are finally picking up over the next few days. I like today’s setup in Kansas, though storms probably won’t fire until early in the evening. Tomorrow looks very interesting from southeaster Kansas to western north Texas. CAPE values will be in the 4000-5500 j/kg range with a strong 850mb jet and a nice mid level shortwave. This should produce numerous supercells capable of tornadoes across those regions. Monday is beginning to look like a major tornadic supercell day across western Oklahoma. But a couple more things need to line up before it really does look amazing. Then Tuesday appears to be a good supercell/tornado setup across central Oklahoma/Kansas. Storm northeast of Pratt, KS. Today (Friday) was a chase day with low expectations. 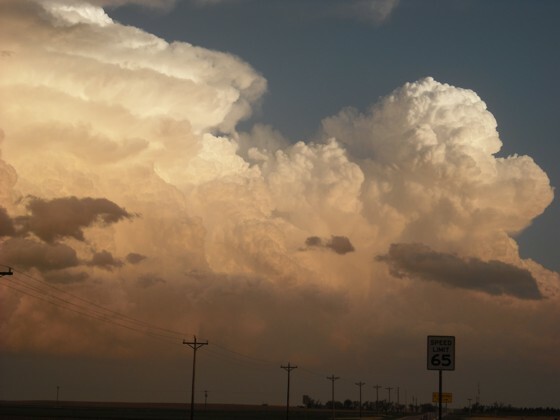 Disorganized, non-severe storms fired early in the afternoon across western Kansas. We walked around a Walmart to stretch our legs in Pratt, Kansas as I glanced at radar images on my cell phone. Finally, a cell began to show *some* organization to our west. So I decided to go ahead and get in front of it. The storm showed some supercellular characteristics at times. 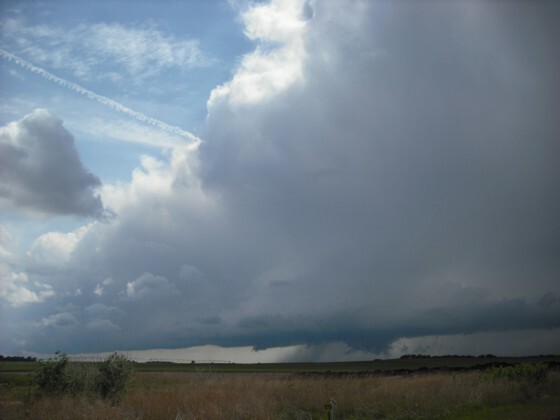 For example, it produced three separate, non-rotating wall clouds. It also had a well defined beavers tail for a little while. But it wasn’t able to hold all these features for very long, and it continued to struggle overall. 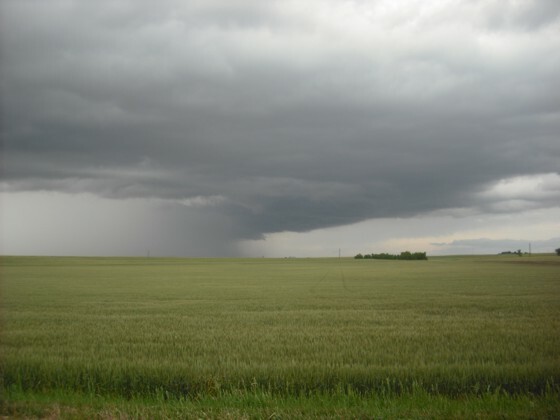 A funnel-like scud cloud. 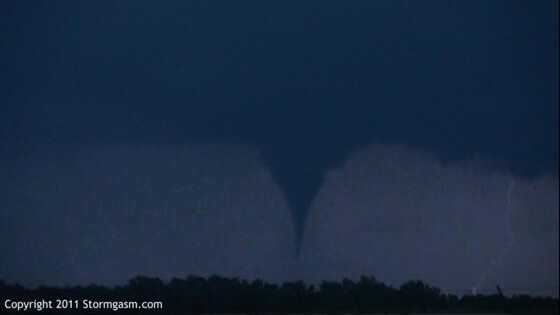 I'm a little surprised this was not reported as a funnel! 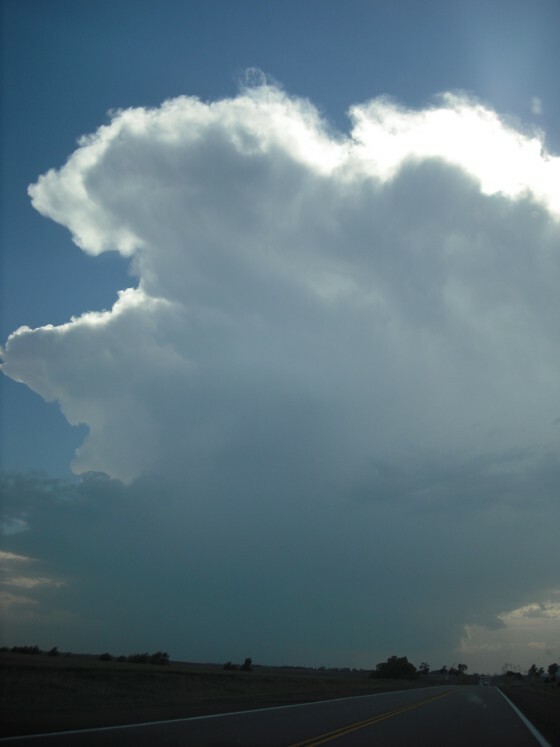 The image above shows the decent, yet brief supercell structure from this tiny little cell. I’m not sure if it even had a severe thunderstorm warning for it! Looking north as we re-positioned. 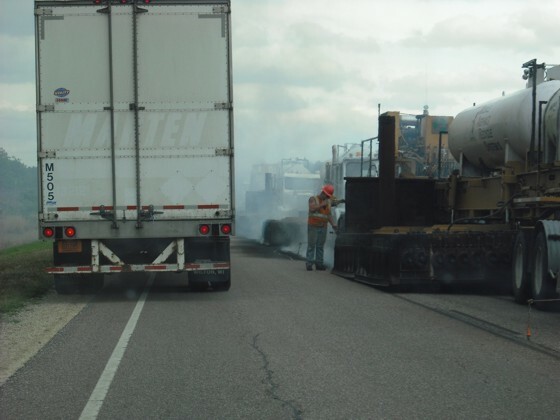 In the image above, you can see some major construction going on on highway 61. Well, once the storm was getting close to us, we decided to head south a few miles to get on highway 61, which goes northeast for quite a ways. It seemed like a good idea to keep up with this cell. Unfortunately, right when I got on this highway, I ran into this major construction. We had to wait for about 15 minutes before moving across one lane for several minutes. We had seen many chasers and chasing tours on this storm, and I’m sure all of them eventually got road screwed by this just like we did. Looking northbound on highway 61 at the southbound traffic, waiting for us to pass by for their turn to go. Horrible! Above is another image of the road construction. 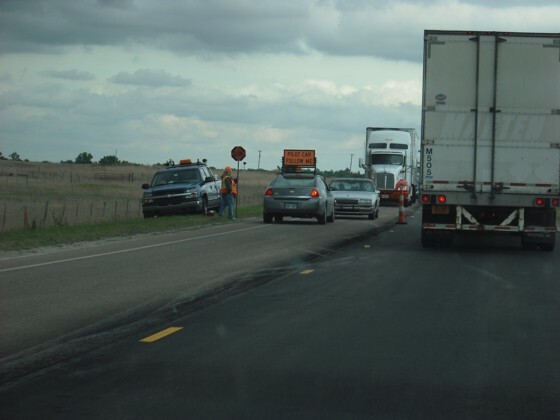 Seriously, this is a perfect example of how easy it is to get road screwed out here in the plains. 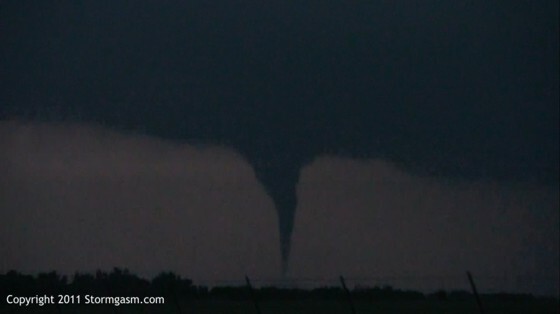 I’m just glad there wasn’t a major tornado on the ground, or there would have been some major problems. We dropped south to just east of Pratt for this new cell. Ironically, soon after getting out of that construction, the storm began to fall apart (go figure). A new cell was taking over further to the south. So we picked a paved county road from my trusty Kansas map, and dove south. 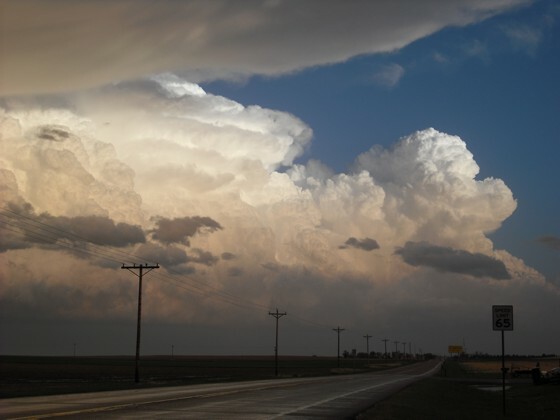 The storm was over Pratt, KS and the image above was taken a few miles east of Pratt. The storm was pretty, but excited very little supercell structure IMO. Cell east of Pratt, KS. The past several days have been enormously disappointing, with one unfavorable setup after another. So it’s been really stressful driving all over the place to see not a whole lot. 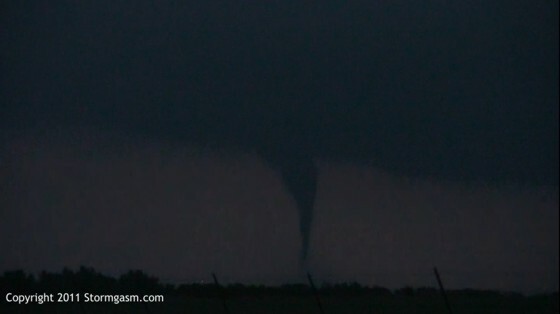 What I can say is today we saw about every chasing tour that is out there, along with a couple dozen other chasers. 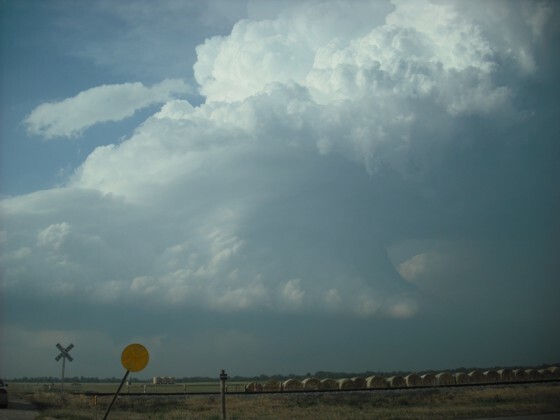 It was entertaining to see all these chasers out there only because the storms were not really a good show. I do have some decent hope for tomorrow here again in Kansas. I think we’ll finally get the right combination of shear, CAPE and forcing to at least produce solid supercells. The tornado potential doesn’t look amazing, but I think there may be a couple out there. After yesterday’s bust in Enid, Oklahoma, I thought today (Thursday) would be a much better day in Kansas. Unfortunately, the atmosphere decided not to cooperate with my schedule. 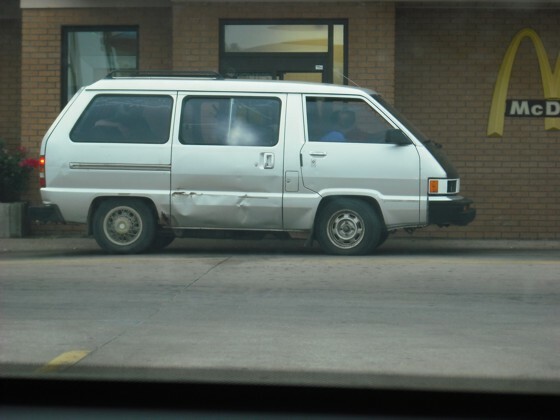 BTW, we saw some ‘sweet’ vehicles going through the drive through at the McDonald’s in Enid on Wednesday. I don’t really feel like recapping the whole day today. But, MaryLeigh and I did run into a lot of chasers today (Thursday) in Medicine Lodge, Kansas at a gas station. 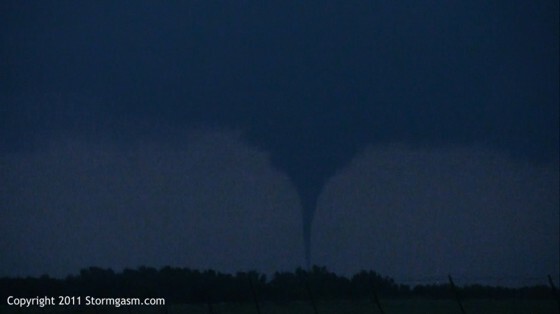 We saw some of the same chasers that we encountered in Colorado two days ago, as well as many others. I even saw a bunch of chasers talking to some guy who was driving a car that had a roll cage! It turned out to be Jeff Piotrowski. Anyways, the next several days look active across the central/southern plains (with the exception of maybe Saturday). A strong system is showing up on the GFS/Euro models early to mid next week, so that could be a big day across Oklahoma or Kansas. Tomorrow (Friday) looks interesting across the same areas I drove across in Kansas today. Hopefully things pan out better. A friend of a friend lives in Greensburg. A storm fires to our west and amounts to nothing. 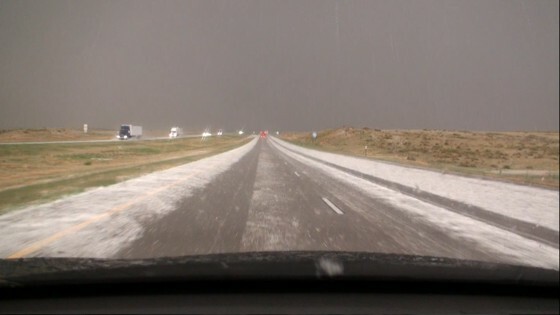 Hail storm west of Burlington, CO. I realize I always say this, but it’s getting late and I’m tired! MaryLeigh and I have driven all over the place during the past couple days. We drove from Derby, KS to Amarillo on Monday and spent the night there. I wasn’t sure if I wanted to chase in the Texas panhandle, or head north into Colorado for Tuesday. Upon looking at the morning data on Tuesday, Colorado looked like the smarter of the two choices. Though neither looked great. After many hours of driving up highway 287 we made it to Burlington, CO. We ran into a chasing tour and TWC’s “The Great Tornado Hunt”. Storms were firing to our west, and there was already a tornado warned storm well to our northwest. But there wasn’t much CAPE, so the storms were clearing struggling. After driving through the hail, we had a long drive back to Derby, KS ahead of us. We arrived at our friend’s house in Derby, exhausted, around 3 a.m. 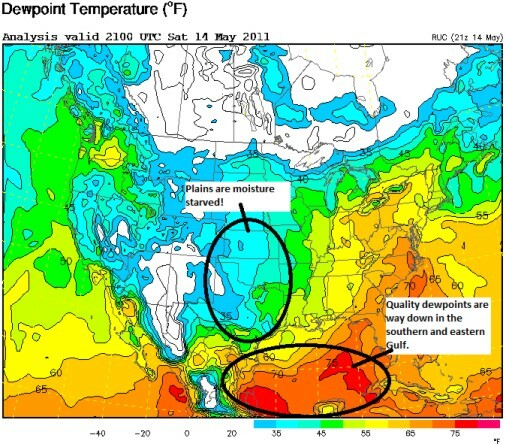 Surface dewpoints May 14, 2011. Notice dewpoints are in the 30s and 40s all across the southern plains. All the deep moisture has been forced south and east into the Gulf of Mexico by the cold front. A strong cold front has surged through the southern plains and Gulf of Mexico, removing the low level moisture necessary for supercells and tornadoes. So I’ve been catching up on some much needed sleep and recuperation. 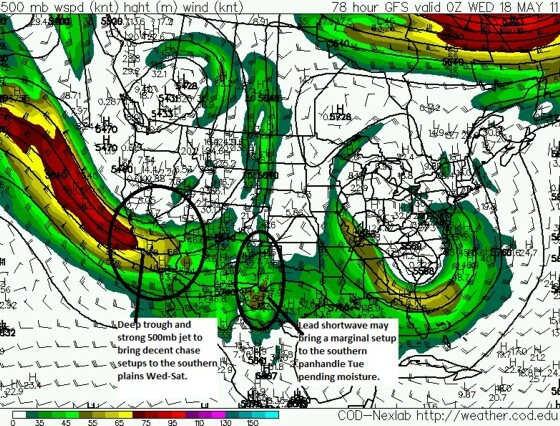 But a trough currently over the eastern Pacific is forecast to eject into the southern plains by Tue/Wed of this upcoming week, and this will bring a series of chase setups from the Texas panhandle to Oklahoma and Kansas mid week through the weekend. It’s disappointing to have to wait to basically mid week for another storm chase. However, my wife and I have undergone so much intense traveling, driving, and stress over the past couple weeks that a few ‘down days’ are actually quite welcome at this point. So we’ll take it. Getting back to the setups by mid week, the degree of return moisture at the surface is a big concern. The cold front plowing through the western Gulf of Mexico is doing a great job of removing all the quality, low level moisture. So it’s going to take some work to bring it back to Texas, Oklahoma and Kansas by Tue/Wed. At any rate, at least upper 50s to lower 60s dewpoints should return by Wednesday across western north Texas and southwestern Oklahoma, which will bring a supercell and potentially tornado risk to that area. 12z May 14 GFS 500mb winds valid Tuesday, May 17 at 7 p.m. CDT. The setups looks synoptically similar to this past setup on Wednesday, with a closed 500mb trough and strong 850mb flow. So while the setups won’t be classic, they may hold good tornado potential in some areas, but not all. This main trough should keep setups alive through Friday or Saturday across the southern plains. So, we’ll be heading into the southern Texas panhandle for Tuesday if moisture return is adequate, or southwestern Oklahoma Wednesday, depending how the moisture return begins to unfold. Until then, more time to rest before a lot more driving ensues in a couple days.